The most abundant algae in the intertdal zone at Whitburn were the kelps and wracks (mostly Fucus and Laminaria species). We visited at low tide, so saw them as a thick layer strewn across the rocky platform. However, once the tide comes in, the buoyant stems and leaves lift up and the seabed is transformed into a forest of fronds, gently swaying in the current. Dirk Schories’ image in this year’s Hilda Canter-Lund award shortlist gives a good idea of what such a “kelp forest” looks like from underwater. Just as the trees in a terrestrial forest provide a structure within and around which many other organisms live, so the kelp is itself a “foundation species”, providing both habitat and resource for many other members of the intertidal community. And just as ivy uses forest trees as a support, enabling it to climb higher in the canopy, so we find smaller algae growing on the stems (technically “stipes”) of Fucus and Laminaria. A tuft of brown filaments, just a couple of centimetres in length, caught my eye. Even with the naked eye I could tell from the brown “cloud” around these filaments, that these, too, had their own epiphytes. Being amongst so many seaweed experts mean that the filaments were quickly named for me as Pilayella littoralis. The individual filaments were about 30 micrometres wide, with occasional branches. The filaments were divided into cells, each containing many brown-coloured chloroplasts lining the edges. Scattered along the surface of the filaments were club-shaped cells of a diatom called Licmophora, which were attached to the Pilayella filament by a mucilage pad at the narrow end. These, too, were filled with many small, brown chloroplasts, making it hard, at times, to distinguish between the two organisms amidst the muddle of filaments. Just occasionally, the Licmophora formed much longer stalks, with a series of diatom cells budding off, indicating the points when the original cell had divided. a. a filament of Pilayella littoralis from Whitburn, Tyne and Wear, with epiphytic Licmophora cells. b. a stalk of Licmophora cells from the same site. Both images are composites built from “stacks” of individual images using Helicon Focus software. Scale bar: 25 micrometres (1/40th of a millimetre). The similarity in colour between the Pilayella filaments and Licmophora cells is due to the two organisms sharing a number of pigments, most notably a carotenoid called fucoxanthin. This, in turn, suggests a common evolutionary origin. Pilayella belongs to the same group of algae as Fucus and Laminaria, the Phaeophyceae, or brown algae. I was about to sketch out a rough evolutionary history of these in relation to the diatoms, linking them both via a common phylum, the heterokontophyta. However, as I was checking some facts using the very useful website www.algaebase.org, I found that this uses an alternative classification. 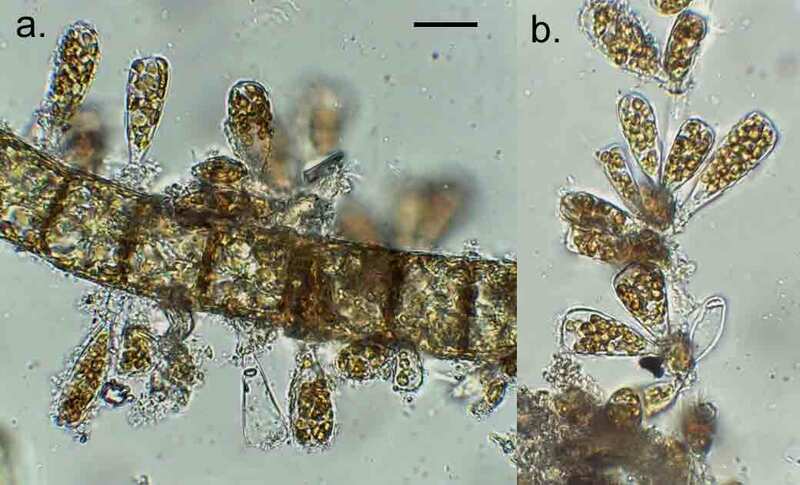 In this, diatoms and brown algae are found in separate phyla, the Bacillariophyta and Ochrophyta respectively. Diatoms and brown algae do share a common origin, but the story may have changed since I last had to teach this and I need to go and do some more homework. The better part of valour, said Falstaff, is discretion, and rather than incur the wrath of taxonomists (any ten of whom will venture at least eleven opinions on high level classifications), I will stop at this point.